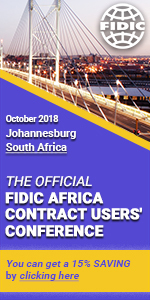 We're delighted to announce that this year’s official FIDIC Africa Contract Users’ Conference will take place in South Africa! This is the meeting place where contract users from across the region connect with the FIDIC team in order to share best practice and ensure that projects are running as efficiently and effectively as possible.The 2018 programme is particularly pertinent as this will be the first opportunity in Africa to hear the FIDIC Contracts Committee explaining the changes introduced in the new 2017 FIDIC Suite of Contracts, including the opportunity to put your questions and concerns directly to Committee. Which sessions will you choose to attend? Take a look at this year's programme. Time bar provisions: what’s changing? See the new agenda now or register here with your 15% saving. To receive your 15% saving courtesy of CESA please use this link or quote VIP code FKW82843CESL when booking. Plus, there are early bird savings available. The 15% saving comes off the applicable standard price at the time of booking ofthe earlier you book, the more you’ll save!